Odyssey class represents the next stage of Starfleet Cruiser design, emphasizing stability and firepower while allowing for versatility in exploration. In the Star Trek Online timeline of 2409, the galaxy is embroiled in war with numerous threats to peace and stability. This Enterprise is designed to carry a message of peace, as well as to show the strength of resolve that forms the foundation of the Federation. UPDATE: Bigger picture, with more angles! 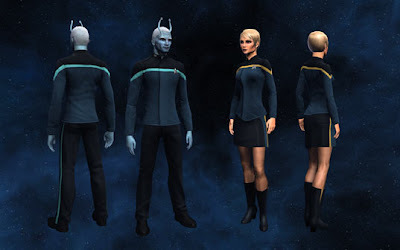 The Enterprise-F will be appearing in a future feature episode of Star Trek Online, and the class will be available to players of the game. 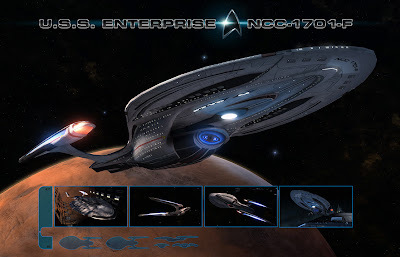 The STO website also has a special page up with links to all the blogs on the design process of the Enterprise, have a look. I see no progression of design here. It's a throwback, and I'm disappointed.